« A Constitution for the United States of America or of the United States? Some claim that your birth certificate is a security instrument traded on a stock exchange. 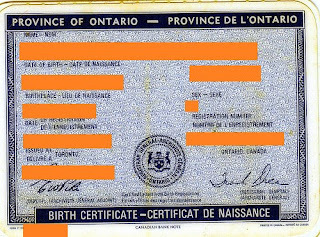 In the case of an Ontario birth certificate, some point to the mention of “CANADIAN BANK NOTE” on it. At first glance, that would seem to be clear evidence of it being a bank note. Therefore, the mention of “CANADIAN BANK NOTE” isn’t a reference to the birth certificate being a Canadian bank note, but to the company of the same name that prints it. If Ontario’s birth certificates are being traded on a stock exchange such as the NYSE, as some allege, then we should expect to find mention of them in the filings for the province of Ontario in the United States Securities and Exchange Commission’s Company Search database. From the filings for the province of Ontario (CIN: 0000074615), we should expect to find mention of that in the annual reports or prospectuses. A further search turned up no such evidence. But even before going this far in the investigation, the fact that some are claiming that a note is being traded on a stock exchange shows that they don’t know the difference between a stock and a note, and therefore, their entire claim is dubious from the very beginning. Stock exchanges trade shares in the stock of a company, not notes, which are debt instruments. For the claim that Canada is a corporation, see my article, SEC Company Search shows Canada, but not as a corporation. I have read many books on UCC code, yes I understand us signing our rights away under Contract Law and that the UCC code can retain our rights if we assert them correctly. However, I have tried finding my Birth Certificate being traded exactly as Elias has written down the instructions. I tried to the “letter” and I had 0 results. Either my birth certificate is NOT being traded or it’s all a SHAM! I do believe in the UCC codes because of the research I’ve personally done, but the rest of it I have my doubts unless there is ANYONE that can show they followed Elias instructions above, as I did and had results. Can anyone out there show that Elias instructions work? Elias? DJ, they don’t work — hence the accuracy of my article title. Why does my certificate of birth have 2 red letters on it & what do they mean , Can you direct me on how to find this out ? From what state/province? In any case, no one has yet demonstrated it’s traded on any exchange. Someone claimed you could look up your number on fidelity.com, only to say it’s no longer working. I bet whatever it showed was no birth certificate registration at all. I tried it too, and nothing.. maybe Fidelity got wise to it, and is blocking it now? or Its Not Real, but makes sense they would do such a thing. Never Trust Bankers. O.K., I get tired of schmucks who never read a law book and dont do research. YES, a security is traded on the markets and your Birth Certificate is evidence of that Security. Your State(the people, not the citizens) pledged the citizens as slaves for the debt. I have a document from the Commonwealth of Kentucky and the US department of Labor which identifies my son as “commercial and industrial equipment”, So my guess is whoever wrote this article is an idiot, no research on his part. The truth is we are all slaves to the state(see blacks law) a citizen is not the people. The bankers own everything including your children and the judges uphold that claim. So jordan maxwell is by far smarter and more educated than the svhmuck who wrote this article. Children are being taken away from familys under the uniform commercial code. The correct term for a birth certificate is “a certificate of existence for a Registered Organization” that Organization” it is a government agency” it is also subject to statutes as well as the UCC. Your birth certificate is not being traded, YOU ARE. You are the security. and all your property. So dont listen to people, go find out yourself. But “woe to him that seeks the truth and finds it”. May god bless America and to Hell with the United States(a corporation). Derivatives are traded as options contracts, not as stocks. Corporations and legal names share similar properties because they are persons. Can someone provide any evidence of someone’s birth certificate trading on any exchange? That’s all I’m asking for. You are full of garbage, and a 2-bit shystering Carny-Barker pandering UCC & Law Merchant Legal Code and 3rd string, punt-return Legal Presumption Game Theory as if it is FACT, instead of fiction ONLY. You see, dear sir, I just pulled mine…and it isn’t traded at all. PROVE it, by FACT, SHOW ME YOURS that it is traded…or go sit in the corner with the rest of the kooks. Kids…stay away from kook-tastrophe “Sovereign” movement created by the FBI solely to destabilize the system far enough, to re-vamp the legal code into the United Nations trash of “Human Rights” and their Star Chamber “courts”, domestically (since after all…the United States corporation HAS signed treaties just for that). 4. Click on ‘Symbol Look Up’. 6. Make sure the top two drop-down menus are ‘MUTUAL FUND’ and ‘FUND NUMBER’ BEFORE you perform the search to find out who is trading on the FUND for the Birth Certificate. 7. Click on the Initialed Trading Company name under ‘SYMBOL’. This will give you all of the trading information about who is trading on the fund that the birth certificate is a part of. This document was created when you were an infant. Commercial laws allow for you to cancel and rescind this simple contract—UCC3-203—and to make a Claim in recoupment (Reparations) for fraud committed upon you when you were and infant (See UCC 3-305). I tried that, and your example came up with no results. Even if it did, it would show the details for a mutual fund, not a person’s birth certificate.